“Sera – OnePage Multi-Purpose WordPress Theme” is a creative modern and multi-purpose WordPress Theme. In line with modern design trends, color fresh and dynamic. Creative Layout and Smart. Super Clear and Clean Layout! This is a great choice! 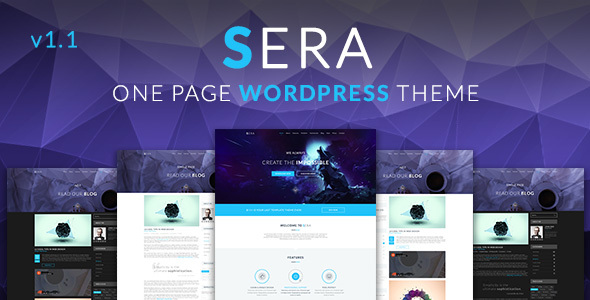 Sera for WordPress CMS is based on Sera – OnePage Multi-Purpose PSD Template designed for WordPress, Jekyll, Joomla and other CMS, a very clean design, simple but better. Premium Home Page Builder, created exclusively for Sera. Fully Customizable Blog Page Layout. Compatible with Latest WordPress Technologies. Easily customizable Color Skin with WP Customizer. Simple one level Navigation Menu. NOTE: Parallax features section is in working yet, but will come soon. - Based on Sera PSD Template. - Based on 1170px / 320px / 768px Grid System.